OCEAN PINES- Club records and personal bests in several events were recorded by two members of the Ocean Pines Swim Team during the Maryland LCS Under-14 championship meet last weekend at St. Mary’s College. Trista Harner, 12, of the Ocean Pines Swim Team, competed in the girls’ 11-12 age group and set several club records and personal bests. Harner’ best finish was second in the 100-yard freestyle, which was a personal best and a new team record. 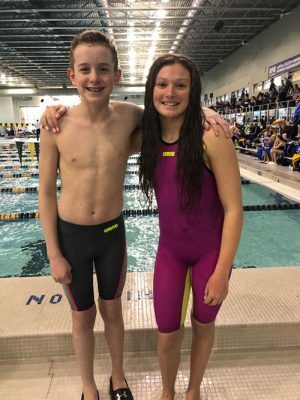 The Maryland LSC under-14 championship meet represents the top swimmers from all over the state in that age bracket. Breyden Wright, 13, also competed in boys’ 13-14 age group and set personal bests and team records in each of his events. Wright competed in the 100-yard backstroke, the 200-yard backstroke and the 100-yard freestyle.